"The Laurie Morvan Band’s latest disc, Fire it Up! (Screaming Lizard Records), features more of her fiery brand of electric blues/rock. Morvan is a first-rate guitarist, influenced by various genres but most especially rock & roll (where she got her start). Once she heard Stevie Ray Vaughan, she was hooked, and forged her own style by mixing rock & roll with the blues. 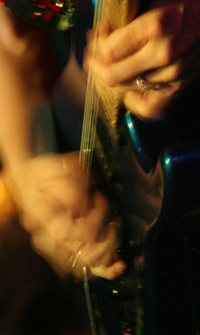 The band made the Top Five at the 2008 IBC in both the live band and CD competitions, a rare feat. The new disc features twelve tracks, written by Morvan. Songs like the double-entendre-laden “Come On Over To My BBQ,” “Good Girls Bad Girls,” “Skinny Chicks,” and “Livin’ In A Man’s World” focus on the blues from a woman’s perspective, while songs like the title track, “I Speak The Blues,” “Testify,” and “Café Boogaloo” are crowd-pleasing house rockers. “Lay Your Hands” and “”You Don’t Know About Me,” showcase her strong vocals, and “Let Me Carry Your Troubles” is a tender ballad about a friend battling cancer. The Morvan Band is a powerful three-piece consisting of Morvan on guitar, Kevin Murillo on drums, and Pat Morvan (Morvan’s ex-husband) on bass. Carolyn Kelley and Lisa (Grubbs) Morvan (who co-produced the disc with Steve Savage) provide stellar backing vocals throughout, and Sammy Avila and Dave Matthews add keyboards on various tracks. 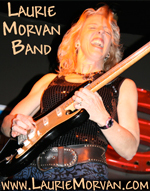 Blues/rock fans will find much to enjoy with the Laurie Morvan Band and Fire it Up! Morvan shows herself to be a fine performer and talented composer. You’ll be hearing more from them in the future." It is not often that such an excellent album crosses my desk from a band that I haven't encountered before. Ms. Morvan is a dynamite vocalist, and forget about the comparisons to Bonnie Raitt or Susan Tedeschi -- her guitar playing stands with some of the best blues work anyone is playing these days. This disc just crackles from beginning to end. A great supporting cast, especially Pat Morvan on the bass. Well recorded. As if that isn't enough, the original tunes are stellar (especially the title track). A very impressive recording, and a name I am going to be keeping my eye on in the future. Blues Festival Guide Online - Guide of Blues Fests, Societies, Artists and more! Southland Blues Magazine - Southern California's primary Blues magazine - includes a monthly listing of live blues gigs in Southern California. Big City Blues Magazine - Bimonthly blues music guide that keeps you in touch with the national blues scene - has indepth articles, interviews, festival reviews, great photographs and CD reviews. Blues Revue - A magazine devoted to the listener and musician whose musical passion is the full spectrum of the blues. Features artist profiles, album reviews, and columns by the most respected writers on today's blues scene. The Blues Foundation - The Blues Foundation is a membership-based organization that relies heavily on a grass roots network of urban or regional blues societies for support. Santa Clarita Valley Blues Society - established in 2003, is one of the youngest Blues Societies in the World and supports the local Santa Clarita Valley and Los Angeles Blues scene. Their aim is to preserve and promote the Blues music art form and invite all those with a passion and appreciation for the Blues to join. The LMB represented the SCVBS when they went to the finals of both the live band competition and CD competition at the 2008 IBC. Great Lakes Blues Society - The LMB has travelled north of the border for 2 shows with our wonderful Canadian friends. These folks love the blues and have put on over 60 quality shows of national blues acts. Way to go GLBS! Friends of the Blues - Keeping the blues alive with shows every week in Kankakee, IL. The LMB has enjoyed performing for these good folks and looks forward to the next event there! Illinois Central Blues Club - the LMB has played some ROCKIN' shows with these fun people. Blues lovin' folks supporting the blues with great shows every week in central IL. Keep up the good work, friends! Los Angeles Blues Society - Their mission is a dedication to preserving and perpetuating an array of Blues music forms in Los Angeles, and the greater area of Southern California, and to introduce these Blues music forms to a wider audience, perhaps not familiar with the Blues. Decatur Blues Society - The LMB loves going to Decatur, IL and performing for these fantastic audiences! So supportive and dedicated to keepin' the blues alive and kickin'! Southern California Blues Society - Promoting Blues for over 25 years, they exist to preserve, promote and advance the culture of the American Blues music tradition for the benefit and education of their members and the general public in Southern California. John Vestman - CD Mastering - A wealth of information for those about to record and master their CD. Over 70 articles on recording tips and techniques, analog and digital audio, mixing, as well as music industry resources. Amazing. John Vestman Mastering - This mastering engineer mastered the last 3 CD's for the LMB - Find My Way Home, Cures What Ails Ya, and Fire It Up! - and pioneered the cutting edge technique of Separation Mastering. Mark Pucci Media - 2008 Recipient of the Keeping Blues Alive Award - Publicist, this firm provides individualized publicity services for CD promotion, touring support and media tracking and interface. Musician's Contact Service - for over 40 years, helping bands and musicians find each other!